My daughters love their sheets. They are cute and soft and definitely fit each of their personality! Love the variety of options for designs. Sheets arrived promptly in great packaging but when I pulled them out to launder a good 8 inches of the side had been sewn incorrectly. I have to take them to a seamstress to repair. Any savings is being eaten up in the cost to repair. The sheets are a little too slick for my taste and the elastic around the fitted sheet is simply run through and not sewn. Very unusual. I love this sheet set for several reasons. Firstly, it comes in full size which is hsrd to get in kid's styles. The colors are vibrant and didnt fade with repeated washings. There is nothing better than getting into a soft, warm sheet in crisp Fall or Winter. The only reason I didnt give it a full five star is that it shrunk a little, but it still fits. These sheets are a bit thin but the price and the cute pattern are awesome! My 4 year old loves the firetrucks! Super soft and comfy! We love the colors! Somewhat big for our 7-inch thick mattresses, but it does the job. Fun, colorful and exactly as pictured. 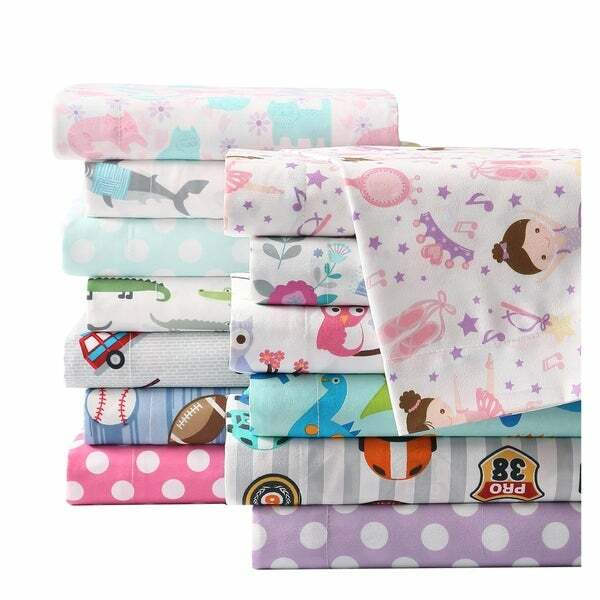 My daughter loves these sheets and says they are super comfortable. Great quality! Kids loved them! Material was good and colors were nice and bright. I would order again. Good choice for kids beds. Good variety of choices. The sheets are very thin. You can feel the mattress through them, I would not buy again. However, the price is fairly adequate as far as quality goes. My daughter did not seem to mind as she was thrilled in how "girly" it made her new bed look. Purchased the pink and white polka dots sheets. They matched with the Minnie comforter I purchased for my daughter...she loved it. "She loves all things Minnie". Very cute print and very soft. They were delivered quick. The kids love them. I just received my new sheets. The quality is really good. The only thing that I was not pleased with are the colors of the sheets. The colors aren't as vibrant as anticipated. My grandchildren loved them upon sight. Cute bright pink with white polka dots. They fit a twin bed perfectly. They feel a little soft and silky. Very cute. Just as described. Soft and cute ballerina print. Very thin material and doesn’t stay on mattress very well. Nice soft sheets. Love the ballerina design. Washed well and fits the mattress perfectly. "What option is the Big Race print? Is it the red/multi? Just a little confusing between the Big Race print & the fire truck print. " "Which option is for the race car sheets?" We are working on getting the colors options fixed on site. Thank you for bringing this to our attention.